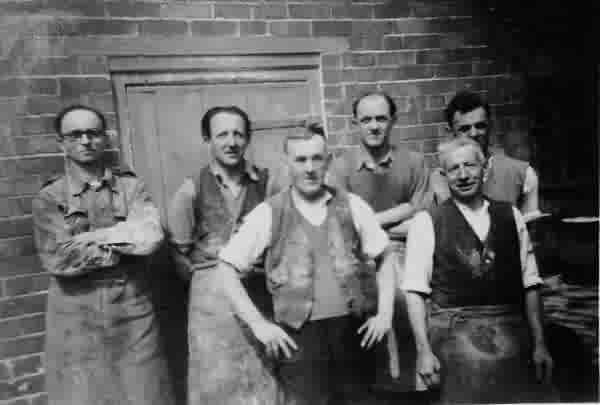 This photograph is thought to be Yeovil leather dressers of Whitby Brothers Ltd. John Allen (1890-1951) from Vincent Street is front right. Spring-loaded wooden finger-stretchers for leather gloves from Hannam & Gillett of Yeovil, ironmongers of the Borough and therefore dating to the period from 1843 to 1870. This pair of glove stretchers might have belonged to either a man or a woman. They were used to help ease tight kid gloves so that they would fit over the fingers. They also helped restore the fingers of the gloves after washing, which made them wrinkled and stiff. The user would place the pointed end of the glove stretcher into the finger of a glove and then compress the handle together so that the two ends splayed out, hence stretching the kid leather. During the 19th century the essential mark of a lady was to have small hands and feet and it was partly for this reason that close-fitting gloves were worn. A well-fitting glove was also an important complement to the tailored appearance of men's clothing. Glove stretchers therefore became a vital wardrobe accessory as they assisted the wearer in easing their gloves.